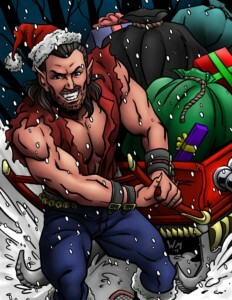 Santa Wolf Returns to Beckon New Holiday Releases! Wow, what a magical holiday season it is for our fans! So incredible in fact that Santa Wolf is making his triumphant return, this time with art courtesy of Wondrous Werner Mueck. Every year our staff at Fed HQ plans ahead for our end-of-the-year releases and we always want it to be special. This year offers a major release in three of our most popular game lines. First there’s the cornerstone of our company, Champions of the Galaxy. We are continuing our proud tradition of releasing fan-made characters with FTR: The Return. You can’t beat wild characters like Mayham, King Tux, Moonlight, and in a continuing nod to our illustrious game history, Astarte (look him up!). I even got in on the party and created would-be conqueror Murtak the Merciless. It will be fun for all involved to add this enhancement talent to the GWF! But there’s more! We continue to release new game expansions with our fantastic partner, Ring of Honor. Look for new playing cards for the likes of Jay White, Caprice Coleman, Kenny King, and more! Your ROH fed will be better than ever! At this point I could say I’m saving the best for last, but our awesome COTG and ROH releases are too good for that, so I’ll simply say that I’m proud that we are bringing new life to our classic Legends game series with Legends Expansion Set 1! This continues our tradition of adding legendary wrestlers to this game line, this time with a focus on great tag teams. There’s the Rock N Roll Express, Sheepherders, Fantastics, and more! Your Legends fed will be alive with more thrilling action than ever! The card art for all these sets spills off the cards courtesy again of Werner. Thanks as usual to our amazing staff of writers that works hard to make these cards as realistic and fun as ever. After three decades plus Filsinger Games is still on the move and it’s all because of our amazing fans! Our goal is to give you game-playing thrills till the end of time. So far, so good.